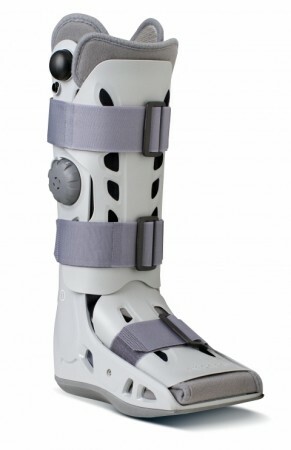 The Aircast AirSelect Elite is a walking boot, engineered to provide protection, comfort, and edema control. The Elite has a durable, semi-rigid shell that helps support the limb while providing full-shell protection. Overlapping Duplex aircells line the shell providing intermittent pneumatic compression for edema reduction. The front panel is pre-inflated and combined with the overlapping aircells, provides a 'total contact' fit. SoftStrike technology absorbs and dissipates shock, while the light weight rocker sole combine to encourage a natural gait and a continuation of everyday activities. Integrated inflation system (NO separate hand bulb). Integrated inflation system puts the patient in control for an individualized fit. Low profile optimized rocker sole. The rocker sole, enables a normal walking gait with less forefoot angulations' and reduces hyperextension of the knee. Trimmable and heat moldable semi-rigid shell. Makes it easy to custom-fit the brace to the patient for a more comfortable fit. Sleek, open-frame design provides ventilation and patient protection and compliance. Shell contours around the malleoli, eliminating pressure for sustained comfort. AirSelect boots have improved width around the ankle area as well as uniformed sizing throughout the various sizes of the boot (XS-XL). Three-strap system. Evenly disperses pressure and helps reduce pooling of edema. Ease of application. Do not over-inflate aircells. Improper aircell inflation may cause significant skin irritation, especially in people with diabetic neuropathy (a diabetic nerve condition). Check your skin frequently for "hot spots" and skin irritation. If you see any skin changes or feelings of discomfort, reduce the aircell compression. Do not use this device if you cannot feel sensations whether due to post-op anesthesia, nerve, skin or other conditions. Use caution when walking on slippery or wet surfaces to avoid injury. -Is the "Elite" significantly better than the XP? -I wear a size 14 shoe and have worn the XP before in a large. It fit well, but my toes stuck out a bit. Is the extra-large a more appropriate size? Is the AirCast AirSelect Elite appropriate for triple arthrodesis (bone fusing)? I already own the AirCast Pneumatic from the previous surgery but I'm intrigued with the thinner sole (easier on my back as I walk) and pneumatic massaging feature in the AirSelect Elite to help with swelling and hasten healing. Also, what is the weight of the AirSelect Elite size medium? Thank you for your question. The walking boot can be used in your situation. It is best to seek the advice of your physician before using this. The ideal weight limit for the medium boot is 300 lb. I have had a complete foot drop since W.W. II. There is a 100% paralysis of the peroneal nerve, residuals of gunshot wounds, popliteal space, right leg. Would this device be appropriate for my disability, and would there be an opportunity to see it and test it prior to purchase? This goes into your shoe and can be worn daily. We do not have trial period for our products however we do have a 90 day money back guarentee on the BetterBraces Website. What is the weight limit on this cast? Can the foam part be removed to be washed? Please call us at 1-800-336-6569, we would like to speak to you regarding your injury. What does a large Aircast AirSelect Elite weigh?